Millions of Miles: Where did your money go? The raff&$ brought in $3580. I split that between Heartline Ministries in Haiti and OFA that will distribute that money through the Congo. Heartline got $1790. I designated that this money be used in the way they saw would help the most people. I felt good about designating it this way since all of Heartline's administrative costs are covered by outside donations. That way 100% of your money got to the people in Haiti who need it! 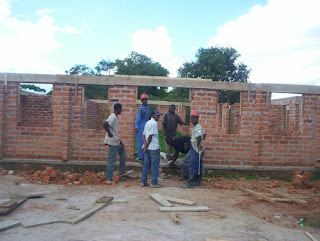 In DRC: we did a previous fundraising campaign that raised $1500! Add that to the $1790 from the raff*& for a total of $3290! Your money will go to help finish construction and buy supplies to get this much needed and much improved facility up and running. If Miles had not gotten adopted this is where he would have grown up. The remaining $790 I will take with me in cash to buy beans (about $75 for a 50 lb bag of beans) and other supplies for the 2 orphanages I will visit in Kinshasa. If we bought any more food than this, there is a risk that the beans will rot before they can get eaten and leaving too much food at any one place can bring about the possibility of corruption. I would have loved to have just plopped down $3000 at the oprhanage so all of those children could eat for months and months. Unfortunatly, this was just not a possibility. The need there is so desperate that that amount of money left with any one person just begs for curruption. I prayed on this decision for nearly a week before I wrote the check out last night. I felt like splitting up the money in this manner benefited the most children. Funneling it through an organization that we love and respect seemed like the most responsible way to get the money to the children. I also made the donation in the name of a Congolese refugee family who is trying to bring home their four granddaughters to the US. 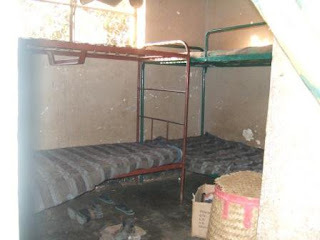 The four girls lived with Miles at the Jamaa Letu Orphanage. That money will be pulling double duty as it will also help those 4 little girls get home to their grandparents. And every little child that gets to go to a forever home frees up space in the orphanage for other children who need a place to go. If you'd ever like to give to any of these organizations on your own- you can do it directly through their websites as http://www.ourfamilyadoptions.org/or heartlineministries.org. You can also check out Corey's fundraiser helping Heartline Ministries.